'Town ...Wall, and Hill Fort of Pandoghar'. Plate 3 from Eight Most Splendid Views of India, sketched by an Officer in the Indian Army, drawn and printed by Baron A Friedel, London, 1833.
bl.uk > Online Gallery Home	> Online exhibitions	> Asia, Pacific and Africa Collections	> 'Town ...Wall, and Hill Fort of Pandoghar'. Plate 3 from Eight Most Splendid Views of India, sketched by an Officer in the Indian Army, drawn and printed by Baron A Friedel, London, 1833. 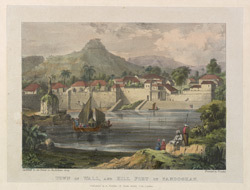 Coloured lithograph of the town and hill-fort of Pandoghar from an original drawing by Baron Adam Friedel (fl.1833). Plate 3 of 'Eight Most Splendid Views of India, sketched by an Officer in the Indian Army' printed by Baron A Friedel in London in 1833. This collection provides eight views of forts situated in the modern state of Maharashtra. In 1818, the British gained control of this area from the Marathas, a Hindu kingdom was established by Shivaji (r.1645-1680). The summits of the Western Ghats, a range of hills that separate the western coast from the central plains of India, were well suited for such defensive structures.